In late 2012, I created a rather ambitious list of twelve books that I hoped to read this year (see it here), and I am happy to say that I’ve already read six of them and am close to being halfway through a seventh, not to mention the six additional books I’ve read that aren’t on the list at all. So since it’s summer, and all the school kids have their summer reading assignments, it only seems the appropriate time to really crack down and catch up. And while I do hope to read more while I’m not teaching and have more time at home, I decided to create some additional assignments for myself this summer. It’s the first time in years – maybe since high school – that I’ve had a definable summer. With my elder son in school five days a week and with me substituting, this break is refreshing. No more four thirty A.M. alarm, a more relaxed dress code – and time. It’s not infinite time. I still work with my parents part-time, and I spend half my day chasing my toddler. But mornings aren’t nearly as rushed. I’ve been able to eat breakfast while reading or writing instead of stuffing my mouth while making everyone’s lunch, getting the kids dressed, and searching for my keys in a last-minute panic. With my few extra stolen minutes, what I really want to do is write. Of course, I want to read more, too, but I felt the pinch more when I didn’t have enough time to write during the school year. I remember back in November, when it seemed every writer in the country except me participated in NaNoWriMo, I thought how nice it would be to have the time to write 2000 words per day. Although I wasn’t that ambitious when it came to my summer writing goals, I thought 300 words a day of both new blog content and fiction would be manageable, and at least I could keep a steady pace. I know it doesn’t sound like much, but I didn’t want to overwhelm myself with unattainable goals. I mainly just wanted to get more on paper (or MacBook) while I could. Thus far, I’ve been able to keep a post or three ahead on this blog, so I haven’t scrambled for content at the last minute (something I did too often in April and May), and even if I can’t write fiction every day, when I do I’m generally writing 1000 to 2000-plus words. As a goal-oriented person, it helped to create something constructive for me to do during the long stretch of what could easily have been non-productive days. Sometimes my enthusiasm makes me go a little overboard, and although it’s a great feeling to ride the wave of a story over my creative horizon, it’s not so fun for the people who live with me. 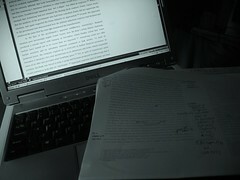 A few nights ago, I sat up in bed, typing well past my bedtime. My husband had been reading but had already gone to sleep. Or so I thought. “Are you going to type all night?” he finally asked. I winced when I saw what time it was and assured him that I was almost done. The next morning he told me he was sure I’d invented a new form of Chinese torture to keep him awake. I think I might be banished to the other room if I want to type late into the night again. In addition to writing daily, I do have one concrete goal: I want to publish a new short story at Smashwords.com before school starts back again. I have about six weeks, and it’s is almost ready. Right now I’m meeting with my cover artist (AKA my mom) and polishing the story itself. If only I could figure out the perfect title, I’d be a little more confident about its release. The only problem with all this writing that I foresee is: how am I going to be able to cut back once school starts again? My summer writing might just turn into my year-round writing. But you know, I could think of worse things to keep me up late at night. This entry was posted in Writing and tagged NaNoWriMo, Reading, Smashwords, Writing. Wow! You’ve been doing great this summer, keeping up with all that! I agree that you might need to give up typing in bed, but I’m glad to hear that you were inspired enough to be on a roll. I’m also glad to hear that your mom is your cover artist. I’m familiar with her talent! She’s a very grudging cover artist. I’m trying to get her to illustrate a children’s book, too, but it’s like pulling teeth.